For extremely accurate continuous flow rate control and recording of granular materials. When fitting new equipment in to an existing production system or designing an optimised new installation, minimising the size of equipment reduces cost. The SLS is the most compact, high accuracy gravimetric feeder available. It is ideal for blending or controlling the flow rate of granular materials to a continuous process when accuracy of feed rate, consistency of performance and excellent stock control are important. The height of the machine is a mere 740mm and being of tubular construction, it is both strong and hygienic. 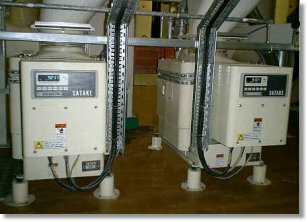 The flow control range of 0.5 – 20 cubic metres per hour represents maximum flow rates of 15 tonnes per hour on products such as wheat, barley and rice. Measurement is achieved using load cells for maximum accuracy. The scale maintains a set flow rate adjusted either locally on the digital display or remotely by the plant PLC. Reporting of current weight, current flow rate and accumulated weight are all built-in features. 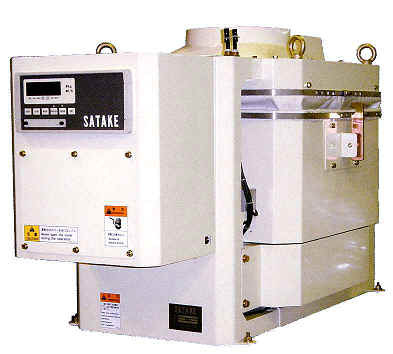 Many recent applications of the Satake SLS Scale have involved the controlled feeding of cereals from intermediate bins in to process systems. The low height of the SLS allows the maximisation of space above the scale, giving the bins higher capacities and reducing installed costs. SLS Scales are also computer linked to provide a blending system for different raw materials.